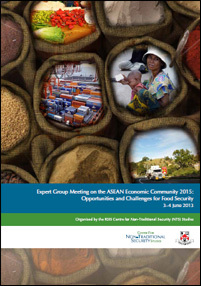 Initiatives under the ASEAN Economic Community (AEC) to promote physical, institutional and people-to-people connectivity are expected to enhance the region’s economic and physical access to food. However, challenges also exist. This report conveys the insights and experiences shared by a cross-section of stakeholders from across the region and from international organisations at an Expert Group Meeting organised by RSIS Centre for Non-Traditional Security (NTS) Studies in June 2013.